I thought these were absolutely brilliant, so I printed one out, taped it to my pole, and pretty quickly saw why it wouldn’t work. 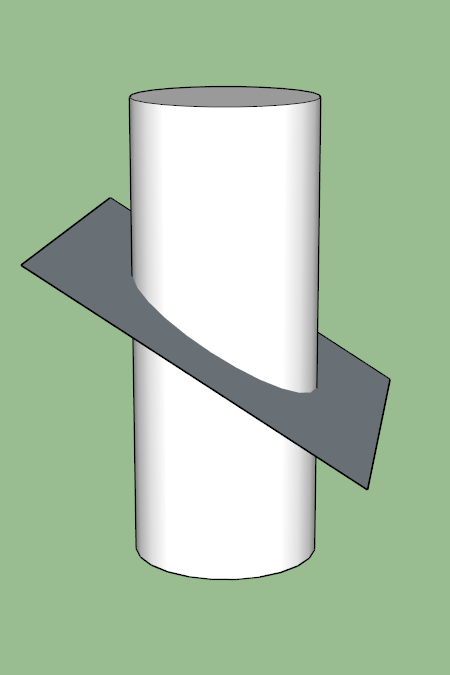 The problem is that these involve straight lines on the sticker, which would be fine if the sticker were applied to a flat surface, but as soon as you wrap it around a cylindrical pole shaft, a 2D projection of the line (i.e. what your eye sees) is no longer straight, and absolutely DOES NOT accurately represent the same angle as the line on the flat sticker did. 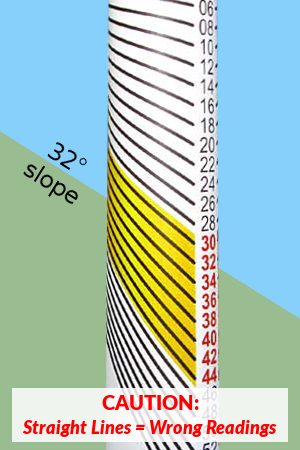 The image here, for example, shows a 32° slope profile behind one of these straight-lined inclinometers. See how the inclinometer lines appear curved? And even if you try to ignore the more obviously curved portions of the lines (near the sides of the pole) you still don’t get an accurate reading. Using that inclinometer I might think this slope was more like 24 or 26 degrees! So while I still consider these straight-lined inclinometer stickers to be very clever, they suffer from a fatal geometrical flaw and simply don’t work accurately. I credit these as the inspiration for the PoleClinometer, but please don’t trust this straight-lined style of ski pole inclinometer sticker! Turns out there’s a pretty simple solution to the problem if we just invoke some mathematical magic to account for the shape of the pole. Dig back into your memories of geometry class for a minute (sorry) and picture an angled plane bisecting a vertical cylinder as shown here. The line around the cylinder where the plane intersects will look straight when viewed from any point on that plane. That’s the line shape we want. The equation for that line as plotted on the 2D “unrolled” surface of the cylinder (i.e. if the sticker were peeled off of the pole shaft and placed flat) is a sinusoid. So that’s the shape of the lines on the PoleClinometer sticker. Isn’t math fun? There are a couple important repercussions of this new shape of “line” we’ve incorporated: On the plus side, we can now use these lines to measure slope angle not just from the side of a slope, but also from the top (see the use page for details) or bottom (same thing only backwards, and a little trickier) of a slope. Pretty cool! On the negative side, the sinusoidal line is such that a sticker MUST be just the right size for a given pole diameter or it won’t work accurately. This just means I have to offer PoleClinometer stickers in different sizes to fit different ski poles. Thankfully almost every ski pole made uses one of three standard upper shaft diameters. So with 3 stickers in each PoleClinometer kit, you can be pretty sure one of ’em will fit your pole. See the fit page for details. Bottom line: Those geometry & trigonometry classes were useful after all! PoleClinometer harnesses the power of mathemagics to make the world a better place.